High capacity, high speed inter-urban rail is high on the agenda in the UK and the need for increased rail capacity on both new and existing routes is urgent. On existing railways, increasing capacity comes at a price. Track geometry deterioration is in simple terms a function of cumulative load, so more trains mean more real-time maintenance unless the track system can be redesigned to be more robust. 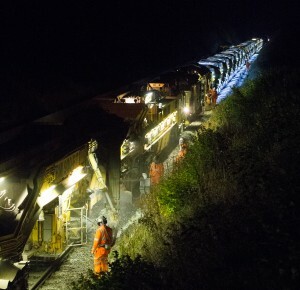 The effect is compounded by the loss of traditional overnight and weekend maintenance windows as trains run earlier and later in the day and passengers expect a fully-functional railway 7 days a week. Increased maintenance has begun to reveal the limitations of current track systems, which have never previously been tested. In addition to the economic benefits, prolonging the life of track system materials reduces the exposure of railway workers to risk and meets the aims of recent EU directives on safeguarding critical raw materials and the development of a circular economy. The first research challenge is to develop low-maintenance, long-life track systems with optimised material use. There are three strands to our approach: developing new track forms; relating stiffness and plastic settlement to geometry deterioration; and extending the useful life of ballast. Work on new track forms includes field studies to test the benefits of random fibre reinforcement and under sleeper pads and in, the laboratory, potentially more efficient sleeper shapes. We use our own numerical modelling techniques to clarify mechanisms of behaviour at the particle scale. The results will be incorporated into integrated cross-Programme models for improved track performance prediction and maintenance planning. In the second strand, we start by reviewing current approaches and models for predicting track geometry deterioration. Data from the field study sites will be used to develop new correlations, back referenced to laboratory data coming out of the first strand of work. 3D dynamic finite element analysis will be applied to investigate the forms and magnitudes of variability leading to geometry deterioration. The new findings will be used to improve current approaches or develop new ones, which will be incorporated into the new integrated cross-Programme models. In the third strand we will build on previous work to investigate deterioration in the mechanical properties of different kinds of ballast, whether fresh, used, cleaned or modified. We shall undertake monotonic and cyclic triaxial tests on full size and scaled ballasts, and full size rig tests in the laboratories at Southampton and Nottingham, and collect field data of live and ongoing settlements and lateral movements before and after renewals. We shall again use discrete element modelling to explore the fundamental mechanisms responsible for deterioration and incorporate our findings into the integrated cross-Programme models.